Google’s ChromeBooks have always been an interesting diversion for the search giant. Android has accelerated past iOS to be the most widely used smartphone OS, and Android tablets are fast catching up with the iPad, but ChromeBooks have in general been cheap and small netbooks, with heavy reliance on the cloud – they did not compare with a MacBook Air. 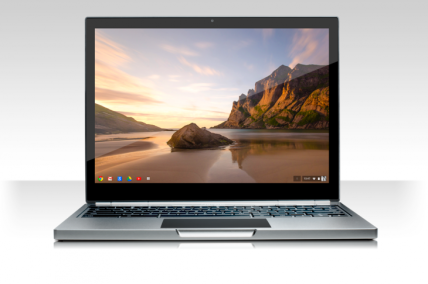 Now Google are taking the fight against Apple into full scale high quality laptops, however, with the release of the ChromeBook Pixel. The ChromeBook Pixel is packing a 12.85″ high-density 2560×1700 screen (at 239ppi this is a higher resolution than the retina displays on MacBook Pros) with a 3:2 ratio, an Intel Core i5 processor and a massive 1 terabyte of free storage on Google Drive for three years. That 1TB in the cloud is only backed up with a tiny 32GB SSD on board though for the WiFi version. Where the Pixel really stands out is that the display is a touchscreen, and with an OS built with such screens in mind, that puts the ChromeBook in a different position to Apple adding touch sensitivity to a MacBook Air. And it is definitely the MAcBook Air Google is aiming for with the Pixel, making the device out of beautiful machined aluminium, measuring just 297.7 x 224.6 x 16.2 mm, and weighing just 1.52 kg. And they’re pricing it at £1,049 in the UK, just less than the £1,067 for a 13″ MacBook Air. And then there is the focusing on Google products that we have all built into our normal routines, such as Google Hangouts. The Pixel packs in three microphones to help noise reduction and picking up clear voices. Gmail, Google Maps, Google Docs and more are all available with the click of a button or tap of the screen as well. Google has long been the leader in consumer cloud software and utilities, but now it looks like they’ve got the hardware to match.